The MatlabKK-Robotic Tbx has been developed by the research group Computational Engineering and Automation at Hochschule Wismar, University of Applied Sciences. It realises the control of industrial robots with Matlab. The Toolbox is tested and validated through a prototype-development based on KUKA/KR3 and KAWASAKI/FS003N robots. Control model design in the engineering and scientific domain are often characterized by the usage of Scientific and technical Computation Environments (SCEs) like Matlab, a famous commercial SCE. The MatlabKK-Robotic Tbx is a further development of the MatlabKukaKRL Toolbox and does also close the gap between robot-manufacturer specific programming languages and SCEs. In addition, the current version of the MatlabKK-Robotic Tbx supports the KUKA Robot Language (KRL) and the KAWASAKI Robot Language (AS). Figure 1 shows the extension of the KUKA/KAWASAKI environment by adding a PC including Matlab. 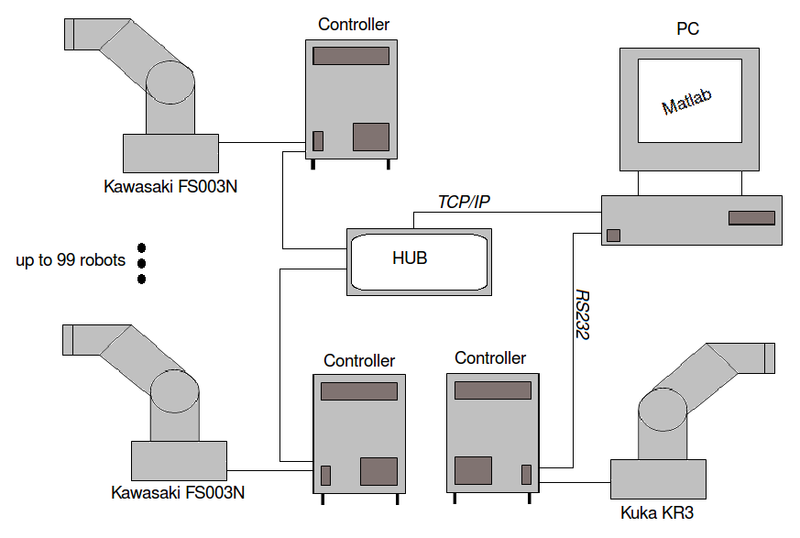 KUKA controllers are connected via serial interfaces RS232 and KAWASAKI controllers are connected via Ethernet with the PC. The control program for the heterogenous robotic environment is developed using Matlab with the MatlabKK-Robotic Tbx and runs on the PC. Interpreters are implemented in KRL and in AS to realise a bi-directional communication to the PC. Moreover, the interpreters are responsible for the identification and execution of commands that are transmitted by the PC.